Background: Human parathyroid hormone (hPTH)(1–34) was approved in 2004 for the treatment of severe osteoporosis. Members of the Osteoporosis Canada clinical guidelines committee conducted a systematic review of randomized controlled trials (RCTs) to assess the efficacy and safety of hPTH for fracture prevention in postmenopausal women and men with osteoporosis. Methods: We searched MEDLINE, EMBASE, HTA, Current Contents and the Cochrane Controlled Trials Registry for published data from 1966 to February 2005. A systematic literature search for RCTs was conducted using the Cochrane Collaborative approach. We identified 12 trials that randomly assigned patients either to hPTH or placebo or to hPTH or an active comparator and were at least 1 year in duration. Outcomes included change in bone mineral density (BMD), fractures, back pain and adverse events. Two independent reviewers abstracted data on study characteristics and outcomes. Results: hPTH(1–34) significantly increases lumbar spine BMD, with smaller increases at the femoral neck and total hip. hPTH(1–84) significantly increases lumbar spine BMD. The data show a significant reduction in both vertebral and nonvertebral fractures with hPTH(1–34) in postmenopausal women with previous vertebral fractures. There were no data on fractures comparing the approved dose of hPTH(1–34) with active comparators. Interpretation: There is Level I evidence that hPTH(1–34) significantly increases BMD at all skeletal sites except the radius and significantly reduces the risk of new vertebral and nonvertebral fractures in postmenopausal women with prior fractures. In this article we present the results of our systematic review of the literature on the efficacy and safety of hPTH therapy. The hPTH working group included members of the Osteoporosis Canada Clinical Guidelines Committee and scientific consultants with Osteoporosis Canada who have expertise in hPTH or in clinical epidemiology or both. This review was approved by all members of the Clinical Guidelines Committee. We included RCTs of at least 1-year duration that compared hPTH with a placebo or with an active comparator and involved 1 of 3 distinct populations: postmenopausal women with osteoporosis, postmenopausal women with corticosteroid-induced osteoporosis or men with osteoporosis. The primary outcome was the effect of hPTH(1–34) or hPTH(1–84) on either bone mineral density (BMD) or fractures. Secondary outcomes were back pain and quality of life. The Cochrane Collaborative approach for identifying RCTs guided our search strategy.16 We searched MEDLINE, EMBASE, HTA, Current Contents and the Cochrane Controlled Trials Registry from 1966 to September 2005 (see online Appendix 1, available at www.cmaj.ca/cgi/content/full/175/1/52/DC1). Citations of relevant articles and reviews were examined to identify other potential trials. Two reviewers (A.C. and N.Z.) evaluated all titles and abstracts for eligibility. Full articles of relevant trials were obtained to make final judgments about inclusion. RCTS were classified as level 1 (an RCT of adequate sample size, with blinding of subjects and assessors) or as level 2 (RCT that does not meet level 1 criteria, owing to a small sample or methodologic limitations). Fig. 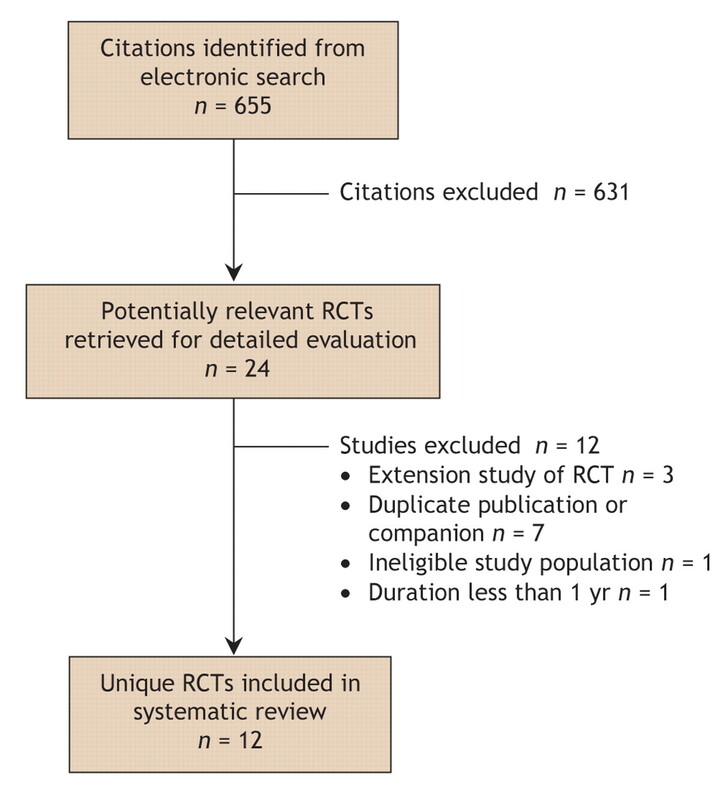 1: Flow of articles through the systematic review. RCT = randomized controlled trial. Six trials compared the effect of hPTH(1–34) with placebo or an active comparator on BMD (Table 4). Doses of hPTH(1–34) ranged from 20 μg/d to 50 μg/d and treatment durations from 1 to 3 years. There was a consistent increase in lumbar spine and femoral neck BMD but little effect on BMD at the distal radius. Increases in lumbar spine BMD with hPTH(1–34) were significant and ranged from 9.7% to 10.3% with 20 μg/d and from 13.7% to 14.3% with 40 μg/d (Table 4). Changes in femoral neck BMD were significant but smaller, ranging from 2.8% to 3.9% in the 20 μg/d group and 4.5%–5.1% in the 40 μg group. Two trials compared the effect of hPTH(1–84) with that of placebo or alendronate. Increases in lumbar spine BMD ranged from 6.3% to 7.8% after one year with 50–100 μg of hPTH(1–84), which were larger but not significantly different than increases seen with alendronate.28,32 Increases in femoral neck BMD with hPTH(1–84) were small compared with placebo and less than that seen with alendronate (Table 4). There is level 1 evidence that hPTH(1–34) 20 μg/d and 40 μg/d increase BMD at the lumbar spine and proximal femur and decrease the risk of both vertebral and nonvertebral fractures in postmenopausal women with prior vertebral fractures. The effect of hPTH(1–34) on hip fractures has not been assessed. hPTH(1–34) results in larger increases in lumbar spine BMD than alendronate. There are no head-to-head fracture trials that compare the efficacy of 20 μg of hPTH(1–34) to bisphosphonates in decreasing the risk of fracture. There is level 1 evidence that hPTH(1–84) increases lumbar spine BMD in postmenopausal women with osteoporosis. The small increase in femoral neck BMD and decline in total body BMD may reflect a transient imbalance between cortical remodelling and bone formation. The decline in BMD at the distal radius seen in hPTH trials is not felt to be indicative of decreased bone strength and may occur as a result of the increased width of the radius.3 The absence of head-to-head fracture data suggests that hPTH(1–34) be limited to patients at high risk of fractures by virtue of very low BMD and pre-existing fractures. There is level 1 evidence that combination therapy with alendronate and hPTH(1–84) may blunt the anabolic effect of hPTH on BMD. There are no fracture data comparing the effect of the combination of hPTH and alendronate with that of hPTH alone. There is level 2 evidence that hPTH(1–34) increases lumbar spine BMD in postmenopausal women with corticosteroid-induced osteoporosis. Fracture data are lacking in this population. There is level 1 evidence that hPTH(1–34) increases BMD at the lumbar spine and femoral neck in men with osteoporosis, but there is no data on fractures in this population. There is no evidence of improved health-related quality of life associated with hPTH(1–34) or calcium with vitamin D in postmenopausal women with osteoporosis. There is level 2 evidence that back pain may be reduced in patients given hPTH(1–34). Transient hypercalciuria (24-hour urine collection showing calcium level of ≥ 8 mmol/d or urine calcium/creatinine ratio > 1.0) was reported in 6 hPTH(1–34) trials and ranged from 0% to 10% difference between hPTH and comparator.29,31,33,35,37,39 There were no reported increases in renal stones. The proportion of subjects with serious adverse events was not significantly different between treatment arms. PTH treatment causes transient increases in serum calcium, but these episodes usually resolve. If they persist, they can be managed by decreasing calcium and vitamin D supplements. Contributors: Ann Cranney was involved in all phases of the review, including its design, literature search, and data extraction and interpretation, and was responsible for drafting the paper and incorporating revisions. Nicole Zytaruk was involved in reviewing the results of the literature search and in data extraction. Alexandra Papaioannou, David Hanley, Jonathan Adachi, Timothy Murray, David Goltzman and Anthony Hodsman were involved in the conception of the project and the interpretation of the data and results, and provided critical input on various drafts of the paper. All of the authors approved the final version of the manuscript and accompanying recommendations. Acknowledgements: This work was funded by an unrestricted educational grant from Osteoporosis Canada. Ann Cranney is the recipient of a salary award from the Canadian Institutes of Health Research. Competing interests: None declared for Nicole Zytaruk and David Goltzman. Ann Cranney has been a member of the medical advisory boards for Merck Frosst Canada and Zelos Therapeutics and has received speaker fees from Aventis, Procter & Gamble Pharmaceuticals, Eli Lilly and Merck Frosst Canada. Alexandra Papaioannou has received speaker fees from Eli Lilly Canada, Novartis, Merck Frosst Canada, Amgen, Sanofi-Aventis and Procter & Gamble Pharmaceuticals; she has received unrestricted educational grants from Eli Lilly Canada, Merck Frosst Canada, Sanofi-Aventis and Procter & Gamble Pharmaceuticals. David Hanley has received an honorarium from Eli Lilly for being available for consultation during the past 2 years. He has participated in the major clinical trials of the 2 parathyroid hormone preparations that are either approved or under regulatory review for the treatment of osteoporosis; these trials were sponsored by the manufacturers, Eli Lilly and NPS Pharmaceuticals. David Hanley did not receive personal remuneration for his work as an investigator in these trials. He has been on the advisory board for the clinical trials conducted by NPS Pharmaceuticals and was a coauthor of the phase II and III clinical trial manuscripts for hPTH(1-84) but did not receive personal remuneration for his authorship of these articles. He has received speaker fees from Eli Lilly and NPS Pharmaceuticals and honoraria for attendance at their advisory board meetings, some of which were held in association with major scientific conferences. Jonathan Adachi has been a consultant and speaker and has received honoraria and travel assistance from Astra Zeneca, Eli Lilly, GlaxoSmithKline, Merck Frosst, Novartis, NPS Allelix, Pfizer, Procter & Gamble, Roche, Sanofi-Aventis, Servier and Wyeth. Timothy Murray has been a member of the advisory boards for NPS Pharmaceuticals, Eli Lilly Canada, Procter & Gamble and Aventis and has received speaker fees from Eli Lilly Canada and Novartis. He has participated in clinical trials funded by Eli Lilly and Novartis but did not receive personal remuneration in connection with these grants and received an unrestricted educational grant from Merck Frosst. Anthony Hodsman is a member of the medical advisory boards of Eli Lilly Canada, Sanofi Aventis, Zelos Therapeutics, NPS Allelix, Novartis Canada, Servier Canada and Merck Frosst Canada. He has participated in clinical trials funded by Eli Lilly, Novartis, NPS Allelix, Sanofi Aventis and Zelos Therapeutics. Brown JP, Josse RG; Scientific Advisory Council of the Osteoporosis Society of Canada. 2002 clinical practice guidelines for the diagnosis and management of osteoporosis in Canada. CMAJ 2002;2002:S1-34. Riggs BL, Parfitt AM. Drugs used to treat osteoporosis: the critical need for a uniform nomenclature based on their action on bone remodeling. J Bone Miner Res 2005;20:177-84. Hodsman AB, Bauer DC, Dempster DW, et al. Parathyroid hormone and teriparatide for the treatment of osteoporosis: a review of the evidence and suggested guidelines for its use. Endocr Rev 2005;26:688-703. Murray TM, Rao LG, Diveti P, et al. Parathyroid hormone secretion and action: evidence for discrete receptors for the carboxyl-terminal region and related biological actions of carboxyl-terminal ligands. Endocr Rev 2005;26:78-113. Reeve J, Meunier PJ, Parsons JA, et al. Anabolic effect of human parathyroid hormone fragment on trabecular bone in involutional osteoporosis: a multicentre trial. BMJ 1980;280:1340-4. Hodsman AB, Kisiel M, Adachi JD, et al. Histomorphometric evidence for increased bone turnover without change in cortical thickness or porosity after 2 years of cyclical hPTH(1-34) therapy in women with severe osteoporosis. Bone 2000;27:311-8. Hodsman AB, Steer BM. Early histomorphometric changes in response to parathyroid hormone therapy in osteoporosis: evidence for de novo bone formation on quiescent cancellous surfaces. Bone 1993;14:523-7. Jiang Y, Zhao JJ, Mitlak BH, et al. Recombinant human parathyroid hormone [1-34] [teriparatide] improves both cortical and cancellous bone structure. J Bone Miner Res 2003;18:1932-41. Zanchetta JR, Bogado CE, Ferretti JL, et al. Effects of teriparatide [recombinant human parathyroid hormone (1-34)] on cortical bone in postmenopausal women with osteoporosis. J Bone Miner Res 2003;18:539-43. Dufresne TE, Chmielewski PE, Manhart MD, et al. Risedronate preserves bone architecture in early postmenopausal women in 1 year as measured by three-dimensional microcomputed tomography. Calcif Tissue Int 2003;73:423-32. Chavassieux PM, Arlot ME, Reda C, et al. Histomorphometric assessment of the long-term effects of alendronate on bone quality and remodelling in patients with osteoporosis. J Clin Invest 1997;100:1475-80. Boivin GY, Chavassieux PM, Santora AC, et al. Alendronate increases bone strength by increasing the mean degree of mineralization of bone tissue in osteoporotic women. Bone 2000;27:687-94. Miller PD, Bilezikian JP, Deal C, et al. Clinical use of teriparatide in the real world: initial insights. Endocr Pract 2004;10:139-48. Ettinger MP, Greenspan SL, Marriott TB, et al. PTH (1-84) prevents first vertebral fracture in postmenopausal women with osteoporosis. results from the TOP study. Arthritis Rheum 2004;50:4103. Dickersin K, Scherer R, Lefebvre C. Identifying relevant studies for systematic reviews. BMJ 1994;309:1286-91. Finkelstein JS, Klibanski A, Arnold AL, et al. Prevention of estrogen deficiency-related bone loss with human parathyroid hormone (1-34) a randomized controlled trial. JAMA 1998;280:1067-73. Rittmaster RS, Bolognese M, Ettinger MP, et al. Enhancement of bone mass in osteoporotic women with parathyroid hormone followed by alendronate. J Clin Endocrinol Metab 2000;85:2129-34. Rehman Q, Lang TF, Arnaud CD, et al. Daily treatment with parathyroid hormone is associated with an increase in vertebral cross-sectional area in postmenopausal women with glucocorticoid-induced osteoporosis. Osteoporos Int 2003;14:77-81. Lane NE, Sanchez S, Modin GW, et al. Parathyroid hormone treatment can reverse corticosteroid-induced osteoporosis. Results of a randomized controlled clinical trial. J Clin Invest 1998;102:1627-33. Lindsay R, Nieves J, Formica C, et al. Randomised controlled study of effect of parathyroid hormone on vertebral-bone mass and fracture incidence among postmenopausal women on oestrogen with osteoporosis. Lancet 1997;350:550-5. Kaufman JM, Orwoll E, Goemaere S, et al. Teriparatide effects on vertebral fracture and bone mineral density in men with osteoporosis: treatment and discontinuation of therapy. Osteoporos Int 2005;16:510-6. Lindsay R, Scheele WH, Neer R, et al. Sustained vertebral fracture risk reduction after withdrawal of teriparatide in postmenopausal women with osteoporosis. Arch Intern Med 2004;164:2024-30. Miller PD, Shergy WJ, Body JJ, et al. Rohe Me, Krege JH. Long term reduction of back pain risk in women with osteoporosis treated with teriparatide compared with alendronate. J Rheumatol 2005;32:1556-62. Genant HK, Siris E, Crans GG, et al. Reduction in vertebral fracture risk in teriparatide-treated postmenopausal women as assessed by spinal deformity index. Bone 2005;37:170-4. Genant HK, Halse J, Briney WG, et al. The effects of teriparatide on the incidence of back pain in postmenopausal women with osteoporosis. Curr Med Res Opin 2005;21:1027-34. Deal C, Omizo M, Schwartz EN, et al. Combination teriparatide and raloxifene therapy for postmenopausal osteoporosis: results form a 6-month double-blind placebo-controlled trial. J Bone Miner Res 2005;20:1905-11. Hodsman AB, Hanley DA, Ettinger MP, et al. Efficacy and safety of human parathyroid hormone-(1-84) in increasing bone mineral density in postmenopausal osteoporosis. J Clin Endocrinol Metab 2003;88:5212-20. Hodsman AB, Fraher LJ, Watson PH, et al. A randomized controlled trial to compare the efficacy of cyclical parathyroid hormone versus cyclical parathyroid hormone and sequential calcitonin to improve bone mass in postmenopausal women with osteoporosis. J Clin Endocrinol Metab 1997;82:620-8. Cosman F, Nieves J, Woelfert L, et al. Parathyroid hormone added to established hormone therapy: effects on vertebral fracture and maintenance of bone mass after parathyroid hormone withdrawal. J Bone Miner Res 2001;16:925-31. Black DM, Greenspan SL, Ensrud KE, et al. The effects of parathyroid hormone and alendronate alone or in combination in postmenopausal osteoporosis. N Engl J Med 2003;349:1207-15. Body JJ, Gaich GA, Scheele WH, et al. A randomized double-blind trial to compare the efficacy of teriparatide [recombinant human parathyroid hormone (1-34)] with alendronate in postmenopausal women with osteoporosis. J Clin Endocrinol Metab 2002;87:4528-35. Lane NE, Sanchez S, Modin GW, et al. Bone mass continues to increase at the hip after parathyroid hormone treatment is discontinued in glucocorticoid-induced osteoporosis: results of a randomized controlled clinical trial. J Bone Miner Res 2000;15:944-51. Finkelstein JS, Hayes A, Hunzelman JL, et al. The effects of parathyroid hormone, alendronate, or both in men with osteoporosis. N Engl J Med 2003;349:1216-26. Kurland ES, Cosman F, McMahon DJ, et al. Parathyroid hormone as a therapy for idiopathic osteoporosis in men: effects on bone mineral density and bone markers. J Clin Endocrinol Metab 2000;85:3069-76. Orwoll ES, Scheele WH, Paul S, et al. The effect of teriparatide (human parathyroid hormone [1-34]) therapy on bone density in men with osteoporosis. J Bone Miner Res 2003;18:9-17. McClung M, Miller P, Civitelli R, et al. Differential effects of teriparatide and alendronate on markers of bone remodeling and areal and volumetric bone density in women with osteoporosis. Arch Intern Med 2005;165:1762-8. Cosman F, Nieves J, Zion M, et al. Daily and cyclic parathyroid hormone in women receiving alendronate. N Engl J Med 2005;353:566-75. Ettinger B, San Martin J, Crans G, et al. Differential effects of teriparatide on BMD after treatment with raloxifene or alendronate. J Bone Miner Res 2004;19:745-51. Black DM, Bilezikian JP, Ensrud K, et al. One year of alendronate after one year of PTH [1-84] for osteoporosis. N Engl J Med 2005;353:555-65. Oglesby AK, Minshall ME, Shen W, et al. The impact of incident vertebral and non-vertebral fragility fractures on health-related quality of life in established postmenopausal osteoporosis: results from the teriparatide randomized, placebo-controlled trial in postmenopausal women. J Rheumatol 2003;30:1579-83. Nevitt MC, Chen P, Dore RK, et al.. Reduced risk of back pain following teriparatide treatment: a meta-analysis. Osteoporosis Int 2005;17:273-80. Vahle JL, Sato M, Long GG, et al. Skeletal changes in rats given daily subcutaneous injections of recombinant human parathyroid hormone(1-34) for 2 years and relevance to human safety. Toxicol Pathol 2002;30:312-21. Betancourt M, Wirfel KL, Raymond AK, et al. Osteosarcoma of bone in a patient with primary hyperparathyroidism: a case report. J Bone Miner Res 2003;18:163-6. Palmer M, Adami HO, Krusemo YB, et al. Increased risk of malignant diseases after surgery for primary hyperparathyroidism: a nationwide cohort study. Am J Epidemiol 1988;127:1031-40. Clinical practice guidelines for the use of parathyroid hormone in the treatment of osteoporosis.